I love trying face masks. Either DIY or any ready made masks provided they have some attractive thing in them. The face mask which I going to review is not new but I saw this for the first online. It has been available offline for a long time but couldn’t find it online. Even now it’s only available on Amazon. 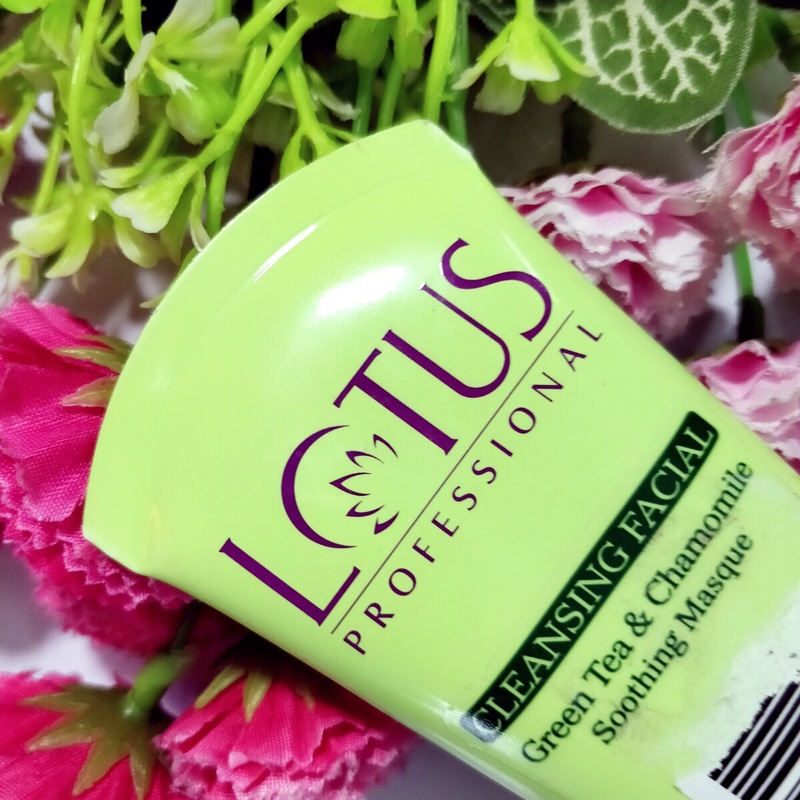 This face mask is from the brand lotus herbals professional which are mostly available in salons. So let me get into the review now. Availability: I got it from Amazon. Water, Titanium Dioxide, Iso Propyl Myristate, Camellia Sinesis (Green Tea) Extract, Garcina Indica (Kokum Butter) Light Liquid Paraffin, Glycerin, Stearic Acid, Steareth-2, Sambucus Nigra (Elder Tree) Extract, Lavandula Officinalis ( Lavender) Extract. Rosa Centifolia (Rose Flower) Extract, Cetostearyl Alcohol, Bees Wax, Emulsifying Wax, Dimethicone Malva Sylvestris (Mallow) Extract, Polysorbate 80, Steareth-21, Alpha Bisabolol, Matriacaria Recutita (Chamomile) Extract, Phenoxyethanol, Alizarin, Cyanine Green, Essential Oil Blend, Disodium EDTA, Methyl Paraben, Propyl Paraben. 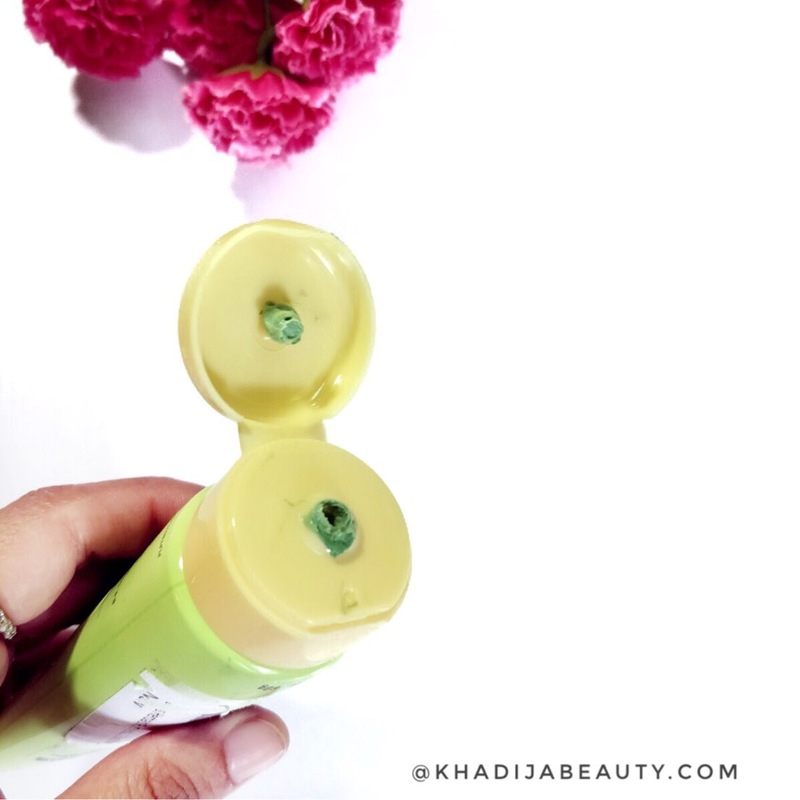 This soothing masque comes in a tube packaging. Very convenient to use and travel-friendly as well. So the only reason why I wanted to try this face mask was, because of the color combination of this tube. The tube is green in color and has a yellow cap which attracted me the most. And also I didn’t hear about this cleansing facial much so wanted to try out and review them for you guys. 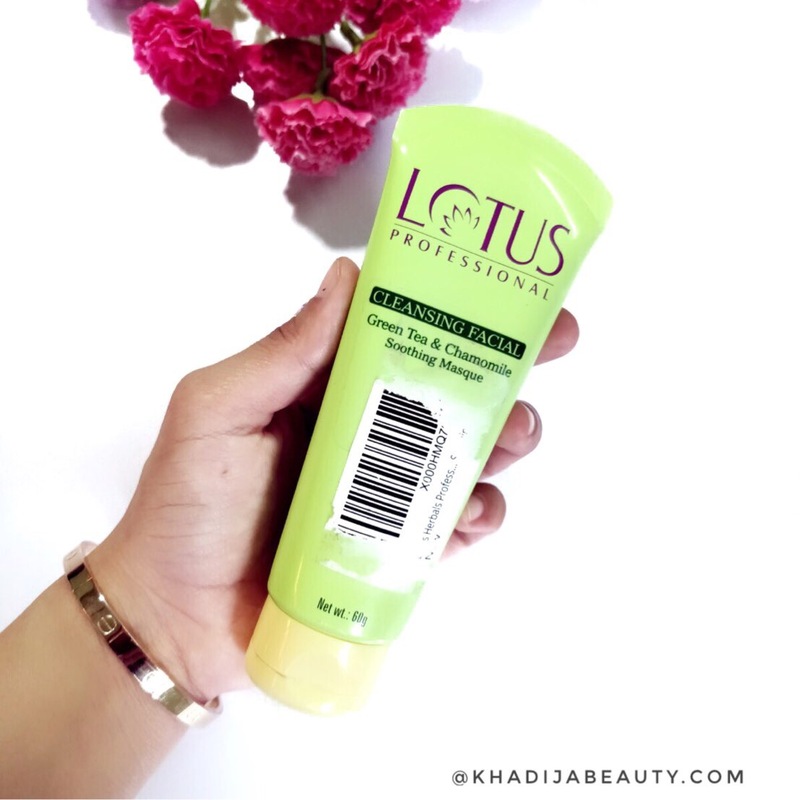 How’s the color & Consistency of lotus professional cleansing facial? 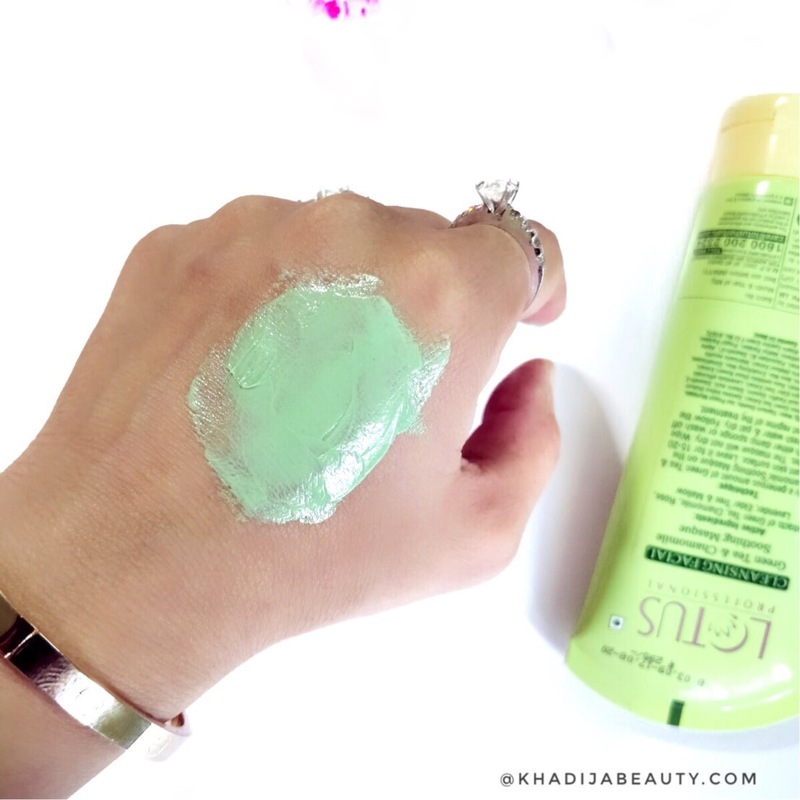 The green tea & chamomile soothing masque is green in color. It looks like a clay mask but doesn’t contain any clay. Plus it doesn’t dry on the face like any other face mask does. And it has a perfect consistency as a face mask to spread easily on the face. Neither too thick nor too liquidy. This green face mask reminds me of frogs. Lol yes after applying on my face I had a green face like a frog. It has a fragrance of mix of chamomile and essential oils which is pleasant and mild. I apply it either with a brush or with fingers all over the face and leave it for 20-25 minutes. When I first applied this, I was waiting for it to dry but even after 25 minutes, it didn’t dry up. It will remain like a thick paste/cream on the face which you can wipe away with a wet tissue or washi it off. After 20-25 minutes I wet my face and gently start massaging this lotus herbals professional cleansing facial all over my face and neck for one minute or less than that and then wash them off with water. Tip: Rub an ice cube or wash your face with cold water after removing your face mask. It helps in shrinking your pores. How is it? What are the after effects? To be honest I have a mixed feeling for this lotus herbals professional cleansing facial. I wouldn’t tell it is the best mask I have ever tried nor it’s the worst mask. 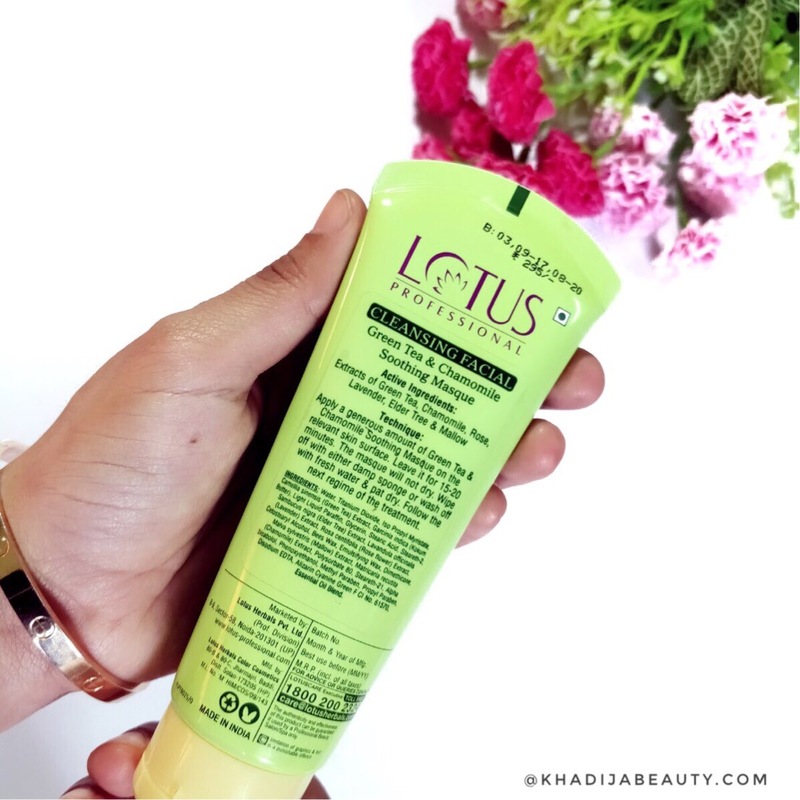 This lotus professional cleansing facial mask contains green tea and chamomile which acts as an anti-oxidant and anti-inflammatory. And it has light liquid paraffin too, which is usually used for deep hydration. So indeed this face mask hydrated my skin and also calms down the skin. I don’t even feel like moisturizing my face further after using this soothing masque. But I couldn’t see any instant glow or anything of that sort which I usually expect from face masks. Though such glow doesn’t last longer still I love face masks that give radiant look after using them. And this disappointed me and my sis too in this case. This face mask is suitable for all skin types and this did not break me out. My both sisters used it too and it didn’t cause any breakouts on their face too. I don’t think this works in drying up the pimples either. This is an average face mask. If you are looking for something that would hydrate your skin deeply in just one use, then you can try this. Else I would suggest you to skip this lotus herbals professional cleansing facial mask. This mask is new to me!! But skipping as per your recommendation. ? Loved Ur review….looking back long for mask suitable for acne prone skin….did u recommend this for the same?